Conducted by NPR, the Robert Wood Johnson Foundation, and the Harvard T.H. Chan School of Public Health, the new polling data found that 55% of whites surveyed believe that “discrimination against white people” is a part of American society. 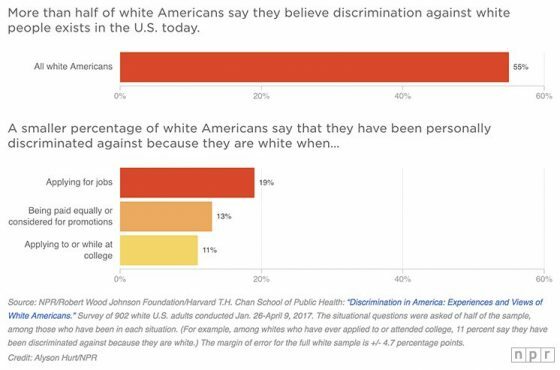 Among whites, 19% said they’ve “been personally discriminated against” because of their race when applying for jobs, while 11% said it occurred when applying to or while at college. Thirteen percent of whites said they experienced discrimination when being considered for equal pay or promotion at work. The poll, which sampled 3,453 adults, only 902 of whom were white, was conducted Jan. 26-April 9, 2017. But all groups surveyed are claiming discrimination at some level. When asked if discrimination against their own group exists, 78% of Latinos say that discrimination against Latinos exists. Approximately 75% of Native Americans, 61% of Asian Americans and 90% of people who identify as LGBTQ said that discrimination existed against their own groups exists in America. Discrimination is an unfortunate piece of the human condition and no law or excessive tax or communist wealth redistribution scheme will change it. But humanity can do better without government mandates. We can treat people the way we’d like to be treated, regardless of the exterior packaging. Next Morgan Stanley Had Anti-Jihad Billboards Removed From Times Square - Guess What They Put In Its Place?